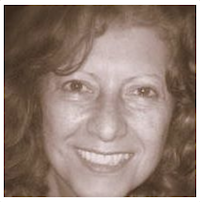 I would like to share this article about my connection with this Artist from Brazil, Antonia Sobral. Her jigsaw puzzles are stunning! I am thrilled to share with you one of the MOST brilliant, personal unique Jigsaw Puzzle gifts I have ever received. This is the kind of gift that is priceless because it is created with the kindness and passion that is shared among jigsaw puzzler. I want to sincerely thank my jigsaw puzzler friend Antônia Sobral from Brazil who was so thoughtful to create, produce and then send me this jigsaw puzzle treasure - I am deeply touched and grateful for our connection. Antonia Sobral Google+ Link I did a mini email-interview with her and discovered these very interesting answers in the production of her work ~ it's well worth the read. Also I have shared lots of photos in a Gallery for viewing. 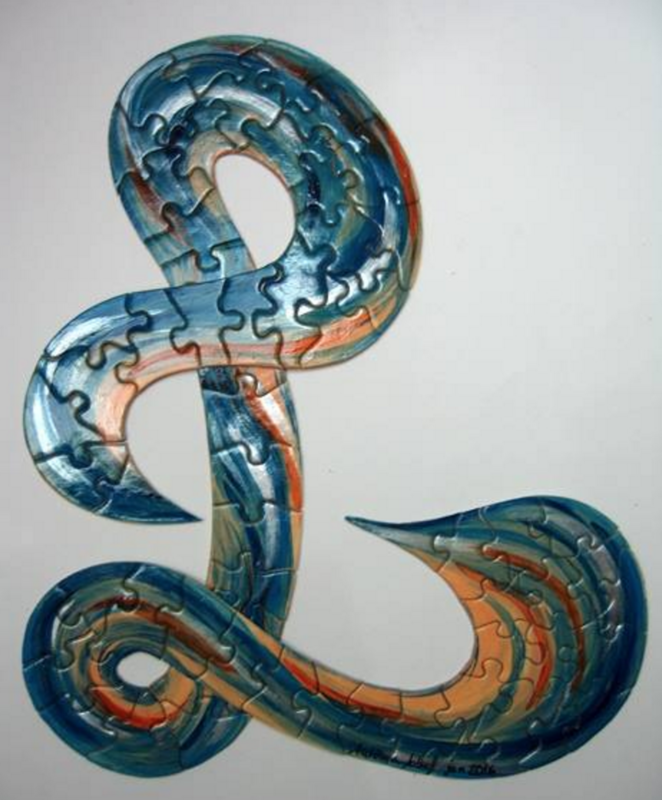 How did you come up with this idea of creating jigsaw puzzle letters? I wanted to give a gift to some people who encouraged me to go on with my work throughout the past year, 2015, but I wanted the gift to be unique and very particular to each of them. I also wanted it to be a sample of the techniques that I have created for my puzzles; so it was important that I made something that could rotate, as it is with the Seahorse puzzle, or had overlaps and ups and downs, as it is in the Snake puzzles. Then the idea of those people’s initials came to my mind. How long does it take to create one from start to finish? It took me an average of three days to complete the whole process, because each puzzle was a different size and had a different number of pieces. The work was distributed as follows: 1 day and a half for drawing, painting, gluing on the base, cutting along the outlines, sanding, cutting into pieces, varnishing and assembling for review. And another day and a half for making the box. Of course we are talking about very small 50 to 80 piece puzzles. What materials are you using for the wood, paints and cutting tools? First of all, let me make clear that the puzzles are made of cardboard rather than wood. I use two types of cardboard: one is widely used in crafts in general and the other one is more frequently used in architectural scale models. The choice of cardboard grade and sturdiness is made aiming at the perfect fitting together of the pieces, as we, puzzle lovers, know how unpleasant it is to try to assemble a puzzle whose pieces won’t hold after being put together. I use several different techniques and materials for painting. I've made some paintings using varnish only, others using oil pastel crayons and I am currently using acrylic paint. Each material has its characteristic and produces its kind of beauty in the outcome. For the snake puzzles I also used a crackle finish varnish to get the snake skin effect I was looking for. When it comes to cutting, I use knives which were made especially for me: I drew them according to my needs and took the drawings to a knife manufacturer. In order to make the cuts, I have to hit hard with a sledgehammer. You need strong biceps (!!) but also care and delicacy of touch so that nothing goes wrong . If you don't mind do you have a cost price to create one? I price my puzzles based on the number of hours spent on the job, the amount of effort and difficulty involved in the making, and the rather intangible factors: innovation and artistry itself. I generally add 10% to that price to cover other expenses such as materials and tools. As I buy the materials wholesale – and therefore the materials bought to make one puzzle end up being used to make some others – and as the knives have to be replaced from time to time because they cannot be sharpened, it is very difficult to determine the exact cost price of a single puzzle. But I can give you an idea of how much I would charge for one letter-puzzle in Brazilian currency (reais). I’m asking R$75.00 for a 50 piece letter-puzzle. If you change that into Canadian dollars, as the Canadian dollar today is worth R$ 2.77 reais, it would be $ 27.07 in your money. (values change everyday, so we have to check how much one Canadian dollar is worth at the date of purchase. It varies a few cents up or down, according to the markets, politics and tourism). I should also add that shipping is a little costly. Depending on the weight and size of the puzzle, it may double its cost or may even be more expensive than the puzzle itself. So there you have it..... really good details on the production of her work.....I want to give her a big round of applause for her achievements and wonderful jigsaw puzzles - please keep us enthused with your creativity Antonia. This certainly was ALL my pleasure to share with my readers. Special thanks to Antônia Sobral for her kindness and sharing her wonderful jigsaw puzzles....looking forward to many more.